On the sister blog, I wrote about a new report on the music industry lamenting that the hype over "Long Tail" retail has not really helped small artists (as a group). This was a tip sent by reader Patrick S. He was rightfully unhappy about the chart that was included in this summary of the report. With only two colors, it is a big ask for readers to shift their sight to the legend on top to understand what the blue and gray signify. Just include the legend text into the existing text annotation! In terms of the Trifecta checkup, the biggest problem is the misalignment between the intended message and the chart's message. If you read the report, you'd learn that one of their key findings is that the top 1% (superstar) artists continue to earn ~75 percent of total income and this distribution has not changed noticeably despite the Long Tail phenonmenon. But what is the chart's message? The first and most easily read trend is the fall in total income in the last 12-13 years. And it's a drastic drop of about $1 billion, almost 25 percent. Everything else is hard to compute on this stacked column chart. For example, the decline in the gray parts is even more drastic than the decline in the blue. It also is challenging to estimate the proportions from these absolute amounts. Recognizing this, the designer added the proportions as text. But only for the most recent year. So we have identifed two interesting stories, one about the decline in total income and the other about the unending dominance of the 1 percent. This is where the designer has to set priorities. Given that the latter message is the headline of the report, it is better to plot the proportions directly, while hiding the story about total income. The published chart has the priority reversed. Even though you can find both messages on the same chart, it is still not a good idea to highlight your lesser message. Joran E. sends us to the following chart via Twitter. The top chart fails our self-sufficiency test. There are only eight numbers in the data. All eight numbers are printed onto the chart. If they were removed, the chart is neutered. The triangle elements are distracting and pointless. The data is encoded in the two ends of those black lines. The two data series have very different scales so that when plotted on the same canvas, the information on digital albums (in red) becomes almost imperceptible. The tiny font size strains our eyes. But the bigger problem with the chart is the absence of numbersense. Start with summing the number of digital albums and the number of tracks. While both units are literally units, they are different units. A host of statistical adjustments is called for. Revenues would be more telling than unit sales since the average price paid is probably not constant across time. Price is typically inverse to quantity. Singles are cheaper than albums so comparing the units of tracks and the units of albums makes little sense. The chart on the bottom is a nice idea but again can use some adjusting. As far as we know, the 47 weeks of sales data have not been seasonally adjusted. While the second half of 2013 looked worse than the first half, this insight is remarkable only if this pattern was not likely based on history. Adding lines from previous years would help put things into perspective. Besides, if sales of other consumption goods fell by 20 percent while sales of digital music dropped by 10%, then by comparison, the digital music industry has fared well. In order to understand the song download data series, we also need to consult the trend for other related goods. Lastly, by using an area chart, the designer is cornered into starting the vertical axis at zero. If a line chart was used instead, there would be no need to start the axis at zero, and consequently, the drop in weekly sales would appear more pronounced. The article's message is that the book, periodical and music stores industry has shrunk drastically (over 50%) in the last 10 years but unless you spend time studying the chart, you're not likely to get this picture. The bubbles are going right and up, which usually is indicative of an increasing trend. What is tripping us up is the employment level occupying the horizontal axis rather than the expected time dimension. The only real way to see the plunge in employment is to focus on the horizontal axis, and to notice the deepening color of the bubbles. The chart is actually a scatter plot of number of firms versus number of employees. The slope of the line gives us the number of firms per employee, which is also unexpected since the usual metric is its reciprocal, the number of employees per company. However, since the slope is essentially constant, highlighting this number is pointless. While the industry is collapsing, the average workforce of the surviving firms has remained more or less the same. I added a cone to the chart to visualize the narrow range in which the employees per firm varied during the past decade. As if it's not confusing enough, the reciprocal of the slope is coded to the size of the bubbles on the chart. This requires a legend to explain. All of this means that readers' attention is directed to the average work force metric, instead of the drop in employment. The following indexed chart shows that the number of employees and the number of firms dropped in step during the ten years. Both dropped about 55% during the decade. This just confirms that the average employee per firm metric is not meaningful. Can information be beautiful when information doesn't exist? Reader Steve S. sent in this article that displays nominations for the "Information is Beautiful" award (link). I see "beauty" in many of these charts but no "information". Several of these charts have appeared on our blog before. The topic of this chart is both tangible and interesting. As someone who loves books, I do want to know what genres of books typically win awards. However, both the data collection and graphical design make no sense. The data collection problem presents a huge challenge and it's easy to get wrong. The problem is how narrow should a theme be. If it's too narrow, you can imagine every book has its own set of themes. If it's too wide, each theme maps to lots of books. The challenge is how to select the themes such that they have similar "widths". For example, "death" is a very wide theme and lots of books contain it, as indicated by the black lines. "Nanny trust issues" is a very narrow theme, and only one of those books deals with this theme. When there is such a theme, is its lack of popularity due to its narrow definition or due to writers not being interested in it? The caption of this chart said "Cover stars: Charting 50 years up until 2010, this graphic shows The Beatles to be the most covered act in living memory." If that is the message, a much simpler chart would work a lot better. Since the height of the chart indicates the number of covers sold in that year, the real information being shown is the boom and bust cycles of the worldwide economy. So, a lot more records were sold in 2005, and then the market tanked in 2008, for example. That's why the data analyst should think twice before plotting raw data. Most data like these should be adjusted. In this case, you could either compare artists against one another in each year (by using proportions) or you have to do a seasonal and trend adjustment. I also don't see the point of highlighting year-to-year fluctuations. Nor do I understand why only in certain years is the top-rated cover identified by name and laurel wreath. I talked about this stream graph of 311 calls back in 2010. See the post here. I featured this set of infographics/pie charts back in 2011. See the post here. This chart is a variant of the one from New York Times that I discussed here. I like the proper orientation on the NYT's version. The color scheme here may be slightly more attractive. Did days get longer in the last 30 years? Fast Company thinks so. Craig N. sent us to this infographic from Fast Company about MTV's 30th anniversary, nominating it as the worst infographic ever. Apply the self-sufficiency test to this chart. Wish away the printed data. Now, does the chart convey any message? Where is the data embedded? Is it in the white dot, the black dot, the gold ring, the gold disc, the black ring, the eye-white? All of the above? How would one compare the white to the orange? If one measures the lengths of the sides, the ratio of white to orange is about 1.32. If one compares areas of the squares, then the ratio is 1.73. Note that this requires the reader to see through the orange area to size up the area of the large white square. Alternatively, we can compute the ratio of the white area as observed to the orange square, and that ratio is 0.73. The real ratio between 1980 and 2010 sales is given as 3.9/2.7 = 1.44. Given rounding errors, it seems like the designer may have used a ratio of lengths of the sides. The problem is the same whether sides or areas are used. Can the reader figure out that the 1980 sales is about 40% higher than the 2010 sales? I suspect that most of us react primarily to the visible areas, which means that we'd have gotten the direction of the change wrong, let alone the magnitude. Craig really dislikes this one. It's a variant of the racetrack chart. As any athlete knows, inner tracks are shorter than outer tracks. Could it be that days have gotten longer in the last 30 years? Apparently, the editors at Fast Company think so. I agree with Business Insider that the following chart is attractively drawn. It nicely illustrates the rise and fall of various music media over time. 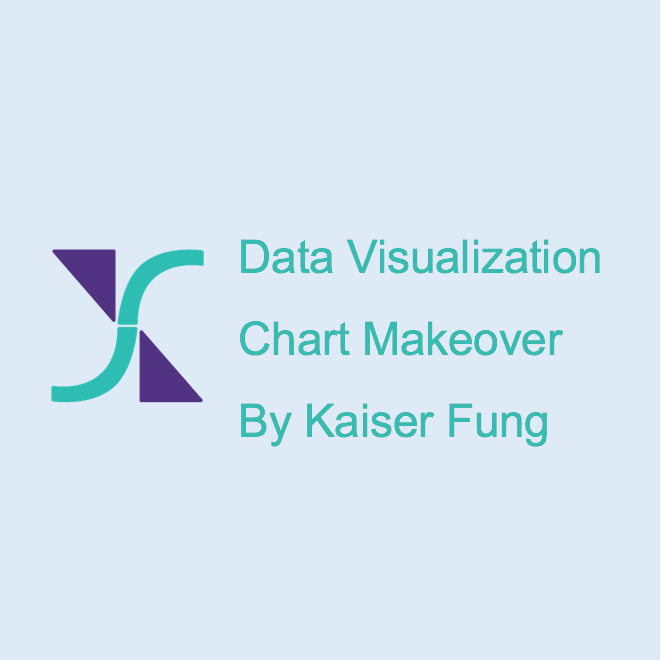 Area charts are more visually appealing than line charts, largely because line charts frequently leave large patches of white space. But one should be aware of some shortcomings of area charts. Notice that the outer envelope of the area chart represents the growth in music sales across all media, not to be mistaken for the growth of any particular media. However, the primary message of this chart relates to the change in mix among different media, not the growth of the total market. Because of the stacking of different areas on top of each other, it is not an easy task to read the growth of any individual piece, such as CDs. Unlike Business Insider who found some answers on this chart, I find that this chart raises a mysterious -- and important -- question: what happened around 2001 to damage CD sales? Since according to this chart, digital sales didn't really show up till 2004-ish, there is a gap of two years or so when CD sales dropped drastically, seemingly of its own volition.